Julia Gonzales was used to the rumbling noises and dark skies. They’re normal when you live in the Guatemalan community of El Rodeo, Escuintla as it’s on side of a volcano. So, Sunday June 3 seemed like any other day. The 62-year-old had just started looking after three of her granddaughters — Angela, 9, Eulalia, 7 and Lidia, 3 — for her daughter Maria Cristina. They all waved goodbye to Maria who carried another daughter, just 10 months old, on her back as her husband pushed a cart loaded with the pineapples they were going to sell. Not long after, they disappeared when the volcano made a sound they had never heard before. Volcán de Fuego — Fire Volcano — had erupted massively. 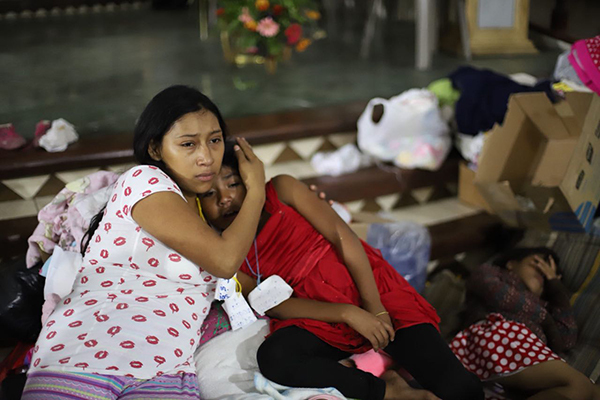 Julia was telling her story in a shelter opened in a local Catholic church by Caritas Guatemala in Escuintla, the local partner of Catholic Relief Services. After the eruption, Julia asked her two sons to go look for their sister and they headed up the hill. Soon they returned, warning of a river of lava, stones and ash coming their way, a river that had already claimed Maria, her baby and her husband. The survivors fled to the shelter. “People here in Escuintla have lost everything - family members, homes, crops, their animals,” said Luis Rolando Sanchez, CRS’ emergency coordinator on the ground in Escuintla. Many among the hundreds in the shelter have stories like Julia’s. There’s the woman who was the only survivor in her family because the eruption tossed her clear of danger. Another woman said she and her three daughters – one just a month old – and her nieces survived while her husband and her sister died. “There will be many orphans and widows,” Sanchez said. The death toll – currently at 99 – is expected to climb into the hundreds as rescuers make their way to villages devastated by the mixtures of hot gas and rock — known as pyroclastic flows — that swept down the volcano’s slopes. More and more people are arriving at shelters as tens of thousands are thought to have lost their homes. CRS is working with Caritas Guatemala and the local government to coordinate a response that meets the growing needs. “My granddaughters have lost their parents,” Julia said, tears welling in her eyes. Nearby, 9-year-old Angela was clearly in shock, unable to comprehend what has happened. Her family comforted her but she could not stop crying.